First-year Los Angeles Lakers head coach Luke Walton and his staff first saw signs during the preseason, when they were still tinkering with their inaugural lineup, searching for player combinations that might work best. As much as they experimented, they noticed how the second unit kept playing together exceptionally well, how the respective skill sets of those players seamlessly meshed together, how it formed an especially strong chemistry, how, almost always, that unit seemed to give the Lakers a better-than-expected punch upon entering the game. 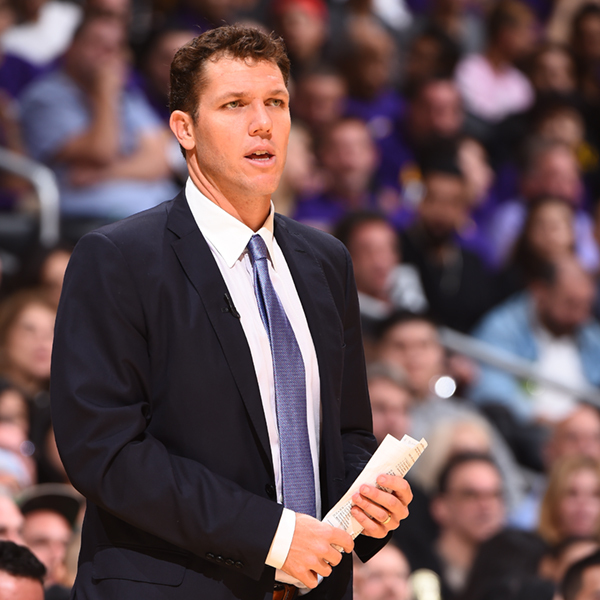 “We got to the point where the bench was becoming pretty special,” Walton recalled Sunday. As Walton and staff worked to solidify the starting lineup, they remained cautious not to mess with their second unit, not to ruin what was clearly becoming something pretty special. Then came the regular season and the eventual injuries that befall every team. Still, Walton drew a hard line against throwing some of his best reserves into the starting lineup, claiming that the bench was arguably their best weapon — the key to their surprisingly strong start as compared to last season — and it was important, if not vital, to keep that unit intact. On recent nights, Walton was again asked why he wouldn’t just take some of his best and most effective bench players and start them instead, but the 36-year-old coach refused to budge. On Sunday, Walton’s insistence on this point was met by some measure of vindication. Against the Atlanta Hawks, the Lakers lacked two starters — forward Julius Randle (hip pointer) and point guard D’Angelo Russell(sore left knee) — but Walton, as usual, decided that the core of his second unit would remain unblemished. And that second unit rewarded him by carrying the Lakers back from an early double-digit deficit and to a resounding 109-94 win, pushing them to 9-9, meaning they already have more than half the wins that they achieved all of last season when they posted a franchise-worst 17-65 mark. The Lakers’ bench averaged an NBA-best 51.2 points per game entering Sunday, and they topped that figure by producing 65 against the Hawks, whose bench scored 24. Lakers guard Lou Williams led the way with 21 points, Jordan Clarkson scored 18 and Larry Nance Jr. added 12 points and 10 rebounds.